(Brundtland Commission, Our Common Future, 1987). Some broader descriptions include social and economic welfare although these can confuse the basic issue of the depletion of resources. 72% of domestic emissions arise from space heating and the provision of hot water. 32% of landfill waste comes from the construction and demolition of buildings. 13% of products delivered to construction sites are sent directly to landfill without being used. Once it has been decided to build a new building, as opposed to say changing working practices or refurbishing an existing building, a very significant commitment to consume resources has already been made. Designers and contractors may be able to help limit that consumption, but they cannot change the overall commitment. This consumption of resources can be even more significant if the client makes a decision to relocate, with the impact this has on their staff, requiring that they either move house or change their travel plans. Decisions such as this which are often made outside of any environmental assessment process can have a far greater impact on sustainability than decisions that designers are able to influence such as the form of the building and selection of materials. Key decisions may be picked up by an environmental impact assessment on larger projects, but even then, this can be a post-rationalisation process used to justify decisions to the local planning authority, rather than a genuine decision making process. Clients may wish therefore to appoint an independent client adviser with specialist knowledge of sustainability during the very early stages of their project (before the consultant team has been appointed) to help them address these high level decisions. Clients may have an existing environmental policy, that sets out an overall sustainability vision, as well as detailed objectives and targets. They may also have environmental accreditation such as ISO 14000 (a series of standards which provides a framework for environmental management). Other standards may be imposed by funders, the building regulations, and planning legislation (including the possible need for an environmental impact assessment). It is wise however to write a specific environmental plan for the development being considered, as building projects involve many detailed issues that go beyond the scope of an existing corporate plan. Business planning: the need for a new building as opposed to doing nothing, refurbishment or changes in working practices. Selection of consultants: contractual requirements in relation to the selection of materials, monitoring and reporting, track record, environmental accreditation and qualifications of staff. Selection of location: availability of transport, the selection of a greenfield or brownfield site, the local availability of resources and services, the local infrastructure and local ecology. Project brief: procurement route, travel plan, working methods, standards, ecology and landscape, energy use and energy source, flexibility and durability, waste management, water management, material selection and pollution. Design: energy use and energy source, embodied energy, use of harmful materials, material sources, ecology and landscape, flexibility and durability, waste management, water management, disposal, travel plan and pollution. Tender: contractual requirements such as monitoring and reporting, working practices, track record, environmental accreditation and qualifications of staff. Construction: transport, embodied energy, use of harmful materials, material sources, working methods, site waste management plan, recycling, pollution, wheel washing, dust generation and noise nuisance. Operation: energy source, energy use, water management, maintenance, resource management, waste management, flexibility, durability, landscape and ecology, pollution, evaluation and feedback. Disposal: dismantling and demolition, re-use, re-sale and recycling, landscape and ecology, hazardous materials and pollution. 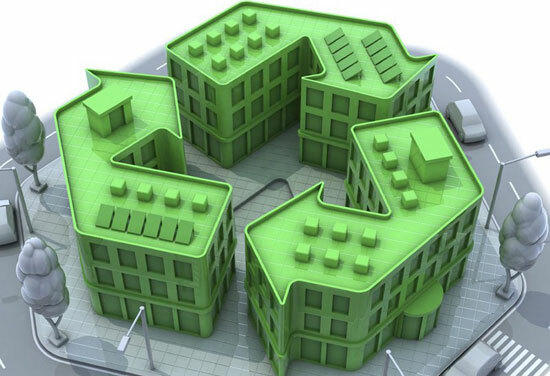 Re-use options such as Enviromate which is a marketplace for surplus and leftover building materials offers a platform to buy and sell free and cheap building materials in the UK. Increasing the product lifecycle through bringing both materials and individuals together offers a tangible solution to construction re-use. Set standards that must be adhered to. Establish risks and mitigation measures. Establish procedures for communication and training. Establish procedures for monitoring and reporting. Establish procedures for revision and updating. Environmental plans require policing, and on a large project this can be a full-time job for a specialist. At the client level, a senior champion should be appointed to take responsibility for environmental matters. Predicting the likely environmental performance of a development during the design phase is becoming more important as regulations become increasing strict. As well as the building regulations, and government targets for low carbon construction (see low carbon construction plan) the National Planning Policy Framework makes clear that there should be a presumption in favour of granting planning permission for sustainable development, this might include low-carbon developments, and developments with resilience to climate change. This should be reflected in design and access statements for outline planning applications. SAP the Government’s Standard Assessment Procedure for energy rating of dwellings. Leadership in Energy and Environmental Design (LEED), an international green building certification system. These assessment techniques are beginning to allow whole-life costing to form a fundamental part of the design process as it becomes possible to demonstrate that higher initial costs can sometimes result in lower long-term impacts and greater long-term benefits. Demonstration of actual performance in use may be necessary through requirements for a Energy Performance Certificates (EPC’s) or Display Energy Certificates (DEC’s). Appointments should make clear the extent and standard of environmental performance and assessment that is required.